From the brilliant www.uksubstimeandmatter.net website-and for a great cause. JET’S GUITAR UP FOR AUCTION! A massive thank you to everyone who has bought the recent UK Subs ‘Tour In Progress’ DVD for the ‘charity fund’ for my family in Japan. I would also like to thank everybody who has donated to our ‘Japanese earthquake relief fund’ box on the merchandise desk at Subs gigs. We will continue this until 7th August, which is the end of this year’s Rebellion Festival in Blackpool. 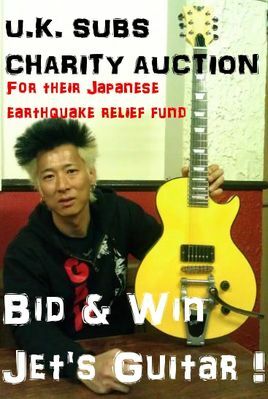 I have been thinking what I can do myself to help, and I have decided to sell one of my guitars and donate all profit to Hitachi city in Japan where I am from. The guitar maker started around 2005, I was probably one of the first ones to use this guitar in the UK and Europe. Other musicians in the artist section on their website are: The Aggrolites, HorrorPops, Roger Miret & The Disasters, Street Dogs, US Bombs and Duff Mckagan etc. This was my project guitar for the future Subs gigs/recordings and I’ve had it modified a bit over the last few years. I was also planning to do more with it in the future, such as neck reshaping and refrets etc. So far I have replaced the original pick up to Bare Knuckle pick ups Rebel Yell humbucker. The bridge is changed to Gotoh; tuning pegs are changed to Gotoh 1/18 ratio for better tuning stability. The strap pins are also changed to Schaller strap pins. The guitar was with me in the studio when we recorded the latest album Work In Progress but not actually used on any of the recording. The guitar itself is still a great condition, only 2 or 3 dents! Please check the photos. Click images to enlarge. There is a lacquer paint crack on the back of the neck joint but this doesn’t affect the sound at all! A hardcase will also come with the guitar, but not the original case, as I never received it in the first place when I got this guitar. At the moment, Ernie Ball 11-48 strings are on this guitar. If you prefer lighter gauge I will put 10-46 on for you. Furthermore, I would also suggest that you change the nut when you get this guitar. For my personal taste, the nut is cut a little too deep. Fitting a new nut is around £20-£30. It will be well worth spending that for a much better tuning stability. I will ship this guitar with the case anywhere in the world at your own cost. You can also pick it up at any UK Subs gig. That would also make a good photo opportunity for the Time & Matter website! The latest HIGHEST BID will be updated regularly on a daily basis, on this website and on the U.K. Subs’ Facebook page. Any bid you make should be at least £5-00 more than the current bid. You will be notified if you are in the ‘winning bid’ position, and will receive updates from the auction administrator. Tuesday 2nd August 2011 at 9.00pm (UK time). The winning bid payment can be made via paypal, personal cheque* or cash. *Subject to the cheque clearing. If you are bidding, please include your full name and where you are from. Thanks.